Passive Margins: Roberts Conference 2016 | Geoconferences (WA) Inc. I wish to express my gratitude to the JH Lord travel grant committee for awarding me the grant and facilitating my attendance to the Passive Margins: Roberts Conference 2016 at Royal Holloway University, London (6-8 April 2016). The biennial conference beings together industry and academic professions to discuss the latest understanding and research into the formation and evolution of passive margins. I was presenting some of the findings of research associated with my PhD. Specifically, I am investigating the structural evolution of the Northern Carnarvon Basin. I presented work relating to the 3D seismic interpretation of a number of areas across the Carnarvon Basin and displacement analysis of several faults on the southern margin of the Exmouth Plateau. The aim of this work is to unravel the timing of nucleation and mode of propagation during the faults lifespan. 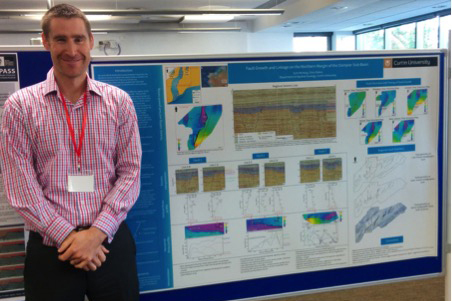 I also demonstrate how the evolution of the faults fit into the regional structural evolution of the North West Shelf. The conference was well attended and feedback of my work was beneficial, particularly given the expertise of people regarding other passive margin systems, particularly the North Atlantic. A number of presentations were focused on mantle processes and it was of interest to discuss how my findings relate to larger scale, regional deformational processes. The conference also allowed me to discuss the methodology of my research and workflows undertaken by other students (both past and present).